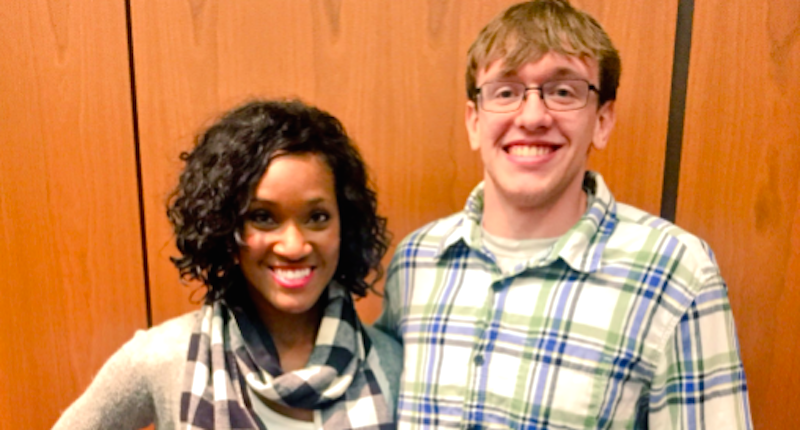 Leanna E. meets with Western High School student Tyler Tackett, who called her the n-word. Indianapolis Colts cheerleader Leanna E. has met with and forgiven a Russiaville, Ind., high school student who used a racial slur to describe her in a photo he posted to Snapchat, the Indy Star reports. On Wednesday night, Leanna tweeted out a photo showing her next to the 17-year-old Western High School student during a meeting at the Colts complex, saying that she chose "forgiveness" and that she feels "stronger because of it." "To receive the apology and be able to formally and officially forgive him and talk and be able to relate on things and find common ground, it was really comforting and helpful for us," Leanna told the news site on Thursday. "I'm at peace with it." The student, identified as Tyler Tackett, had apologized earlier this month after posting the Snapchat photo showing him, a fellow student and two cheerleaders with the caption, "Of course Mason put me next to the n—ger." Today I said something unforgivable and what was said can’t be taken back. I know that I have hurt people and I know that I need to be held accountable for what I have done. I would like to apologize to all of Western School Corporation and all of the students and faculty. I know that I have made all of you ashamed. I would like to apologize to the Colts as well, I realize that I have offended your program. I would like to apologize to my family for saying this because I was raised better and I would like to apologize to everyone that I have offended. I realize what I have said is awful and I truly feel sorry from the bottom of my heart and I know that no amount of apologizing will make up for it. I will accept any consequence for my actions. Leanna ended up meeting with Tyler after inquiring about him Tuesday with Western High School Principal Rick Davis. "I just was concerned for how he was handling it, and [Davis] said he wasn’t handling it well," she said. "That broke my heart to know that." Davis connected the two so they could get a chance to meet face-to-face. The teen apparently greeted Leanna with flowers and a hug. "I extended my hand to shake, and he was like, 'Come on, bring it in, bring it in.' It was a good ice breaker," she said. "He was pretty uncomfortable, which is understandable, but he got right to his apology. He said that he was a kid who made a mistake. He actually referred to himself as a dumb kid that messed up, and he said he was trying to be funny and wasn’t, and that he made a mistake and he was sorry, very sorry for hurting me and others." Tyler's mother was reportedly grateful that Leanna had given her son a second chance, saying that he wasn't raised to be racist and blaming "peer influence." As for Leanna, she doesn't really believe that Tyler is racist; she attributed some of the behavior to what she called the "Trump effect." "It has become acceptable, for some reason, to be racist or make racist comments, and I don’t really know why that is," she said. "The leaders of the nation are making these mistakes, and it’s seeming OK. It's not that surprising that these kids would make the same mistakes. That generation, that age group, they need a lot of help, a lot of guidance. They’ve grown up with phones and technology at their fingertips, and I don't think they have the mental and physiological capacity to fully understand the precautions they should take with the internet and with the future." The cheerleader said that Davis and the Colts organization are hoping to create an educational program from the experience, in which she expects to be heavily involved. "If it has to be somebody, I'm glad that it could be me," she said. "We’re trying to make something positive out of this. I'm able to show more people that there’s a different way than just hate."